Canare L-4E5C Microphone and Audio Line Cable is a narrow profile version of Canares premiere L-4E6S Star Quad cable, for all hand held microphone applications. Specially designed to save space andr educe weight during remote field expeditions or confining installations, and still extremely strong and flexible. 23 AWG Star Quad configuration eliminates handling noise and rejects EMI and RFI. Perfect for all Microphone, Audio Rack Wiring, PA System and Audio Patch Cord use in portable applications where narrow profile is a must. 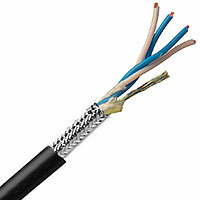 Conductor: 23 AWG, 30 strand (x4) Copper conductors for flexibility and expanded frequency response. Shield: >:96% Copper High-density TAC Braid. Conductor DC Resistance: <:39.7 ohms/1000 ft.
Shield DC Resistance: <:7.6 ohms/1000 ft.